You gotta hand it to both TV manufacturers and Olympic athletes: they never rest, and they never stop trying to get better. 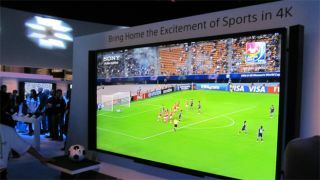 Less than one week after the closing ceremony of the Rio 2016 Summer Olympics, Sony and Panasonic have started to give real thought to Tokyo's upcoming 2020 games – specifically, how the games are going to broadcast and watched by millions of people around the world. The prefered method they've arrived at? 8K Super Hi-vision. To that end, Sony and Panasonic have announced a partnership in conjunction with the largest Japanese broadcaster, NHK, to work on the logistics of rolling out 8K TVs by 2020. The partnership will focus on streaming and compression technology that will enable 8K signals to be transmitted over home broadband connections, as well as the next generation of camera technology that will enable broadcasters to start capturing Super Hi-vision content. Admittedly, it's a long road ahead, as there's currently only one 8K TV on the market (an 85-inch, $130,000 / £100,000 behemoth from Sharp), and next to no native 8K content. However NHK has already conducted a few 8K tests throughout Tokyo using footage from the Rio Olympics, which is a promising start to the project. The end-goal here, according to Japanese business publication Nikkei, is to form "an all-Japanese alliance to reclaim market share lost to foreign rivals." Until 8K takes over, though, we'll just have to settle for one of these amazing 4K TVs.